Obama whines he just didn’t ‘have the tools’ to act on Syria. Related: Obama seems eager to massage his legacy as it’s being written. We, therefore, are obliged to get the record right. Rachel Maddow Tries to Rewrite History of Obama ‘Ending the War’ in Iraq. Flashback: No Doubt About It — We’re Back in a Ground War in Iraq. Without much fanfare, Obama has dramatically reversed his Iraq policy — sending thousands of troops back in the country after he declared the war over, engaging in ground combat despite initially promising that his strategy “will not involve American combat troops fighting on foreign soil.” Well, they’re on foreign soil, and they’re fighting. It would have been easier — and would have cost far fewer lives — if we had just stayed. But Obama had to have a campaign issue. And I suppose I should repeat my Iraq War history lesson: Things were going so well as late as 2010 that the Obama Administration was bragging about Iraq as one of its big foreign policy successes. BOB WOODWARD: Bush Didn’t Lie About WMD, And Obama Sure Screwed Up Iraq In 2011. [Y]ou certainly can make a persuasive argument it was a mistake. But there is a time that line going along that Bush and the other people lied about this. I spent 18 months looking at how Bush decided to invade Iraq. And lots of mistakes, but it was Bush telling George Tenet, the CIA director, don’t let anyone stretch the case on WMD. And he was the one who was skeptical. And if you try to summarize why we went into Iraq, it was momentum. The war plan kept getting better and easier, and finally at the end, people were saying, hey, look, it will only take a week or two. And early on it looked like it was going to take a year or 18 months. And so Bush pulled the trigger. A mistake certainly can be argued, and there is an abundance of evidence. But there was no lying in this that I could find. Look, Obama does not like war. But as you look back on this, the argument from the military was, let’s keep 10,000, 15,000 troops there as an insurance policy. And we all know insurance policies make sense. We have 30,000 troops or more in South Korea still 65 years or so after the war. When you are a superpower, you have to buy these insurance policies. And he didn’t in this case. I don’t think you can say everything is because of that decision, but clearly a factor. We had some woeful laughs about the insurance policies metaphor. Everyone knows they make sense, but it’s still hard to get people to buy them. They want to think things might just work out, so why pay for the insurance? It’s the old “young invincibles” problem that underlies Obamcare. As late as 2010, things were going so well in Iraq that Obama and Biden were bragging. Now, after Obama’s politically-motivated pullout and disengagement, the whole thing’s fallen apart. This is near-criminal neglect and incompetence, and an awful lot of people will pay a steep price for the Obama Administration’s fecklessness. Related: National Journal: The World Will Blame Obama If Iraq Falls. Related: What Kind Of Iraq Did Obama Inherit? Because I expect a lot of revisionist history over the next few months. Plus: 2008 Flashback: Obama Says Preventing Genocide Not A Reason To Stay In Iraq. He was warned. He didn’t care. Related: Obama’s Betrayal Of The Iraqis. Plus: Maybe that Iraq withdrawal was a bad thing in hindsight. Obama’s actions, if not his words, suggest that even he may think so. After the latest hysteria dies down, this chapter in the ongoing psychodrama will be revealed for what it is: a fantasy of a wannabe coup that is not going to happen. The commentariat’s silly claim that the op-ed was “extraordinary” and “newsworthy” is laughable. There are hundreds of “senior officials” all throughout every presidency, no doubt more so in the outsider Trump’s, who are disgruntled. On any given day, any newspaper could root out a “senior official” to write anonymously anything it wished to fit a preconceived narrative. What is extraordinary is not an op-ed from some sort of a mad David Stockman taken to the woodshed or defrocked Don Regan losing a war with Nancy Reagan, but that the New York Times hunted down someone of #theResistance to create a hysteria that an unhinged Trump must be removed. By the scale of past White House melodramas, this is no big deal. It is not as if an off-the radar, rogue band in the White House was caught selling arms to Iran and using the profits to fund resistance to Daniel Ortega’s Marxist regime in Nicaragua. The gossip about Trump’s mental processes are no more dramatic than the rumors were about a doddering Reagan in his second term, which later were trafficked by his own son, Ron Jr. (“Father had Alzheimer’s in office”). Trump is not, in Woodrow Wilson fashion, near comatose and locked up in a White House bedroom, while Melania takes over the country. His aides are not covering up the fact that Trump’s blood pressure is peaking at 250 over 150, or that some mornings he cannot get out of bed—as was true of FDR as he campaigned for a fourth term in 1944. There’s no refuting VDH’s facts or reasoning, although you might take issue with his assertion that the hysteria will die down. Certain stories or tactics will come and go, but the hysteria isn’t going anywhere but up. 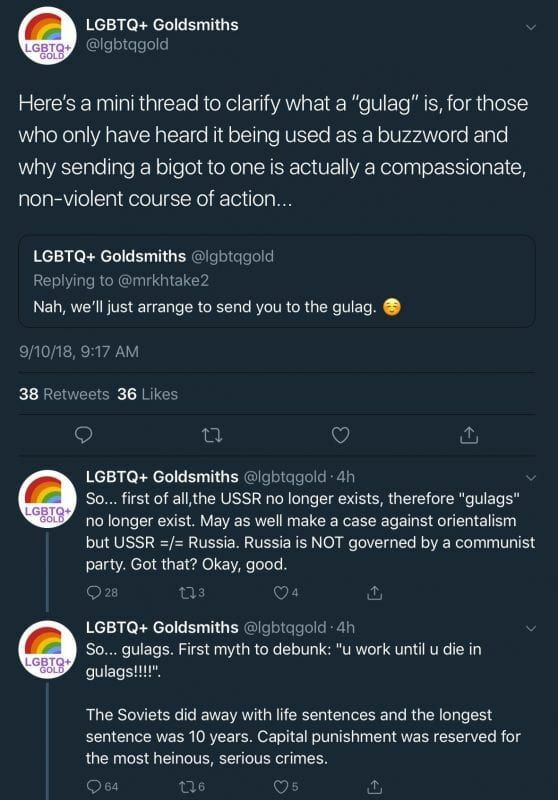 WAR IS PEACE, FREEDOM IS SLAVERY: LGBT student group argues that gulags were good, anti-trans bigots literally kill and must be re-educated. Believe it not, it gets worse from there, as Twitchy notes in the headline link. The Fog of War: Nobody knows much right now. Many things that we think we know are likely to be wrong. Overreaction is the Terrorist’s Friend: Even in major cases like this, the terrorist’s real weapon is fear and hysteria. Overreacting will play into their hands. It’s Not Just Terrorists Who Take Advantage: Someone will propose new “Antiterrorism” legislation. It will be full of things off of bureaucrats’ wish lists. 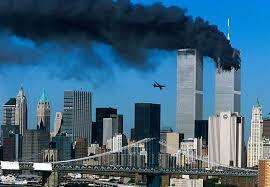 They will be things that wouldn’t have prevented these attacks even if they had been in place yesterday. Many of them will be civil-liberties disasters. Some of them will actually promote the kind of ill-feeling that breeds terrorism. That’s what happened in 1996. Let’s not let it happen again. Only One Antiterrorism Method Works: That’s punishing those behind it. The actual terrorists are hard to reach. But terrorism of this scale is always backed by governments. If they’re punished severely — and that means severely, not a bombed aspirin-factory but something that puts those behind it in the crosshairs — this kind of thing won’t happen again. That was the lesson of the Libyan bombing. “Increased Security” Won’t Work. When you try to defend everything, you defend nothing. Airport security is a joke because it’s spread so thin that it can’t possibly stop people who are really serious. You can’t prevent terrorism by defensive measures; at most you can stop a few amateurs who can barely function. Note that the increased measures after TWA 800 (which wasn’t terrorism anyway, we’re told) didn’t prevent what appear to be coordinated hijackings. (Archie Bunker’s plan, in which each passenger is issued a gun on embarking, would have worked better). Deterrence works here, just as everywhere else. But you have to be serious about it. For now, the terrorists have won. They’ve shut down the U.S. government, more or less. They’ve shut down air travel. They’re all over TV. But whether they really win depends on how we deal with this; hysterically, or like angry — but measured — adults.